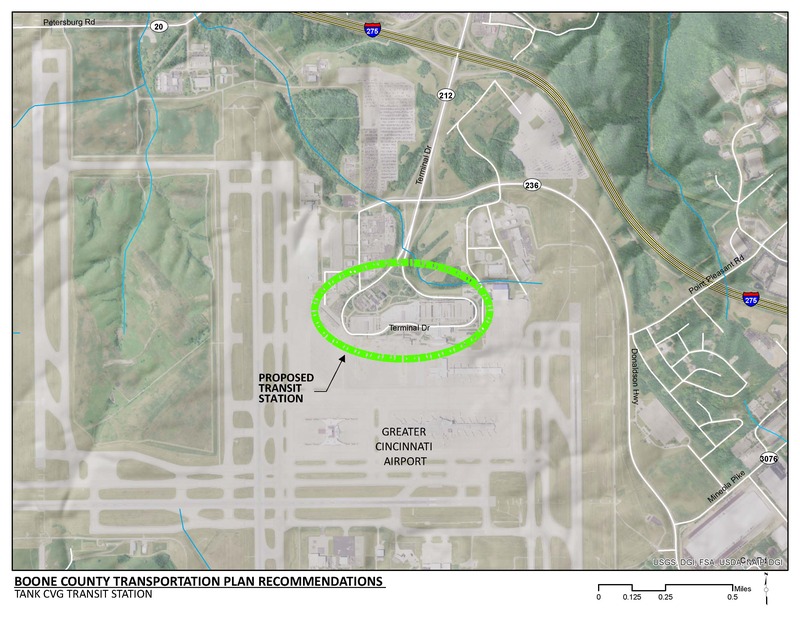 Construct a new transit station at the Cincinnati/Northern Kentucky International Airport (CVG). Include a sheltered waiting or transfer area and a bus bay with storage capacity for up to three, 40 foot buses. Conduct planning of this project in conjunction with the 2017/18 CVG Master Plan Update. CVG is currently conducting a Master Plan Update, so timing is appropriate to consider and include this critical transit improvement to serve CVG customers and employees as well as the thousands of existing and future employees that work at distribution, logistics, and manufacturing businesses surrounding the airport. This Transit Station is proposed as a tool to improve transit accessibility, reliability, and travel time, thereby attracting increased transit ridership and helping to reduce overall traffic congestion. In the future, this facility will serve more than its current role as an anchor in the TANK transit network. Its future role as a major transfer hub for multiple, local and regional fixed-route transit service expansions, Hebron/CVG workforce circulators and site-specific shuttles (refer to Boone County Transportation Plan Tier 1 First/Last Mile Innovative Technology Pilot Projects recommendation) will connect this vital transportation node with the entire region. The specific location and design of the Transit Station have not been determined. A collaborative partnership between the CVG and TANK will examine and evaluate the new Transit Station location prior to implementation. Employment growth on CVG and immediately adjacent properties is projected to increase by several thousand people by year 2040. Besides the airport, the area is home to major companies that serve as significant traffic generators such as DHL Express, Wayfair, Bosch and Fives Machining Systems. Population growth amongst properties immediately adjacent to the airport is projected to increase moderately, several hundred people, by 2040. CVG, being located just off of I-275 and west of the I-71/75 corridor, is at the geographic center of TANK’s western service area. TANK currently operates express route 2X (The Airporter) to the CVG Terminal, DHL, and CVG Centre. Express route 1X (Houston Road/Mineola Pike Express) serves Houston Road Park and Ride and other airport adjacent businesses. Several public comments received during the development of the Boone County Transportation Plan voiced their appreciation for existing transit and support for expanding transit as a means of addressing Boone County traffic. Potential origins and destinations outside of the CVG Terminal itself are not within close walking distance. Plans to continue the construction of the CVG Loop Trail beyond KY 1017 (Aero Parkway) are underway and supported by this Boone County Transportation Plan. In the meantime, the OKI Bike Route Guide recommends use of Loomis Road, Whitson Road, KY 20 (Petersburg Road) and O Hara Road as “preferred routes.” However, cyclists are encouraged to “use with caution” Terminal Drive, KY 212, KY 236 (Donaldson Highway), KY 717 (Turfway Road), KY 18 (Burlington Pike), KY 237 (North Bend Road) and KY 3168 (Limaburg Road).